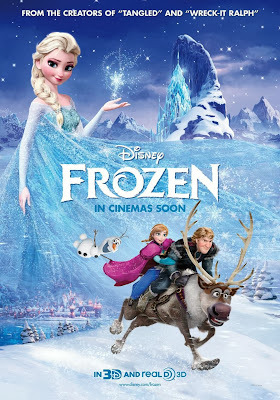 Disney's Frozen has all the right ingredients for a Disney Classic even if it feels a bit like, been there, done that. Frozen is a clever twist on Hans Christian Andersen's classic tale of the Snow Queen. However, if you're feeling a bit deja vu from Princess Anna (Kristen Bell) and Kristoff (Jonathan Groff), then you have every right to feel so. Comparisons to Tangled's main characters Rapunzel and Flint are not that far off. You can even stretch it a bit and replace Sven with Maximus and Olaf with Pascal. Of course being compared to Tangled is not necessarily a bad thing. Both films have great likeable characters, catchy amazing songs, and quick wit humor that children and adults can enjoy. 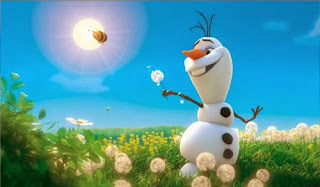 As far as the characters, you have to love the innocence of Olaf the snowman. Especially when he sings the song "In Summer", not knowing what heat does to snow. Spoiler - It melts it. My favorite song though would have to be in the beginning when Anna sings to her sister Elsa, "Do You Want to Build a Snowman?" So what is Frozen about? If you're familiar with the original Hans Christian Andersen's tale, it involves a sibling saving another sibling from an evil snow queen. In this twist, one of two princesses (Elsa) is born with the power of creating and controlling ice/snow. However her lack of control leads to an accident that forces her parents to isolate Elsa away from each other, with the truth to Anna withheld. Many years later, when the King and Queen are no longer with them, the castle is reopened to the public for a ceremony celebrating Elsa's coming of age as the new Queen. Of course, things do not go well at Elsa's coronation and Anna and Elsa's journey begin albeit separately. Overall, I would recommend it to everyone. This is a great film for kids, with a story that is not too complicated to understand in the way it is presented. The villains of the film are not terrifying in the least bit. Adults will love the beautiful animation as well as the characters and humor. Disney shows that they are still masters in storytelling, even if it's a retelling of a classic story. The twist on the Snow Queen character creates a more marketable character instead of the traditional villainous Snow Queen. Lastly, be sure to arrive early to catch the cute Mickey Mouse animated short film, Get a Horse! before the film Frozen.